A pop-up exhibition featuring more than 300 images from the archives of a regional daily newspaper has attracted around 12,000 visitors. The Hull Daily Mail took part in The People’s Gallery after the paper’s long-serving local government reporter Angus Young came up with the idea when giving a talk at the city’s Heritage Open Days event last year. 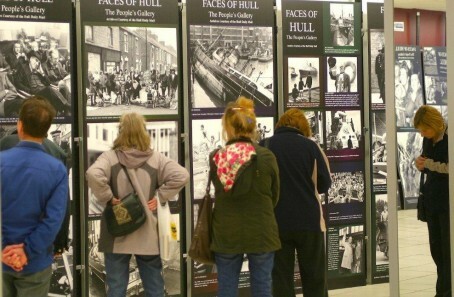 A total of 47 display boards were produced including giant aerial photographs of the city dating back to the 1920s which were stuck to the floor so visitors could get a bird’s eye view of Hull through the years. The four-day exhibition was held in an empty city centre shop unit as part of Hull Civic Society’s annual Heritage Open Days programme. “The Mail has a fantastic photographic archive which is only ever seen in our regular Flashback publications,” Angus told HTFP. “I thought it was high time to stage a proper public exhibition featuring many images which have never been seen for many years. “In a way, it was also a tribute to generations of Mail photographers who were responsible for the images we chose. News photography is a genre all of its own and is often overlooked. “The reaction for people over the weekend was tremendous with many asking for it to become a permanent exhibition. The response was so great that we are now looking at a number of future options. The display boards were produced free of charge by Hull-based commercial design firm Inter Tech while the use of the shop unit was also donated by its owners.